of loaded platform to 3". support for 3-wheeled and 4-wheeled fork trucks.  Non-metallic Nema 4 single push button control. 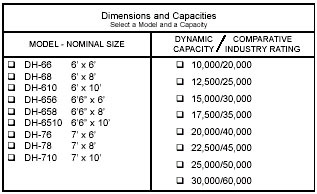  Control components are UL listed or recognized.  Overload protection for motor is standard.  Optional interlocking and integrated panels are available. minimum of 2" cantilever bracket is required. 24" Pit standard on all 60k and 10' levelers. For special service range on 10' and 12' levelers consult us. *Must Select Nema 12 control box. NOTE: For 6.5' use 7' price. both lip and hoist cylinders. Unit conforms to OSHA, U.S. Leveling Devices (ANSI) MH 30.1.
panel features are available. Service range is from 12"
requirements are the responsibility of others. carry and additional nine (9) year pro-rated warranty. single acting design with 3 OD rod and 3 ½ ID bore. 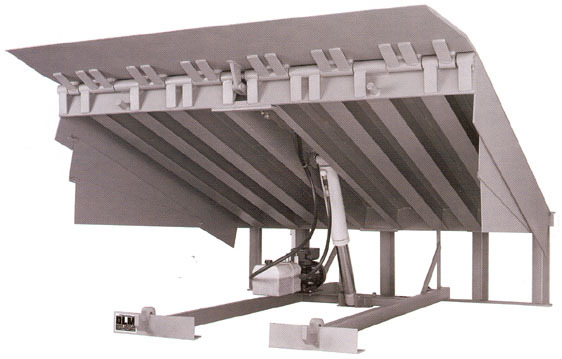 Levelers, Pit Mounted Dock Leveler, and Pit Mounted Dock Levelers from your complete source for material handling equipment.